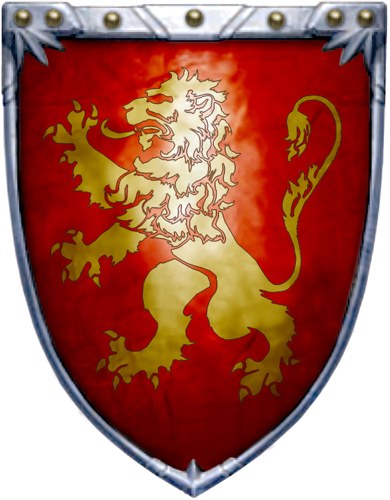 House Lannister is one of the Great Houses of the Seven Kingdoms, overlords over the Westerlands, which is on the far west of the continent. Their house seat is in Casterly Rock, a castle on a rocky promontory overlooking the Sunset Sea. It overlooks the thriving city of Lannisport and sits atop the most productive gold mines in the Westerlands. They are one of the wealthiest family in the realm. They are known for this saying: "The Lannisters always pay their debts." Fair-haired, tall and handsome, the Lannisters are the blood of Andal adventurers who carved out a mighty kingdom in the western hills and valleys. Through the female line, they boast of descent from Lann the Clever, the legendary trickster of the Age of Heroes who swindled Casterly Rock from its previous rulers. An unknown lady, his wife. Jason Lannister, Lord of Casterly Rock (b. 60s). Tyland Lannister, Jason's younger twin brother (b. 60s). Chessa Tyrell Lannister, his wife. (b. 67). Boros Baratheon, Lord of Storm's End (m. 68, d. 104). A younger brother of Tymond and Cora's.